One piece of our application for a Metropolitan Chicago Synod mission grant that Unity is pursuing, is a relationship and possible call to Pastor John Roberts as a part time assistant pastor to Unity. John would preach occasionally and help free up Pastor Kinsey for other parts of the mission plan, as well as be part of our mission outreach. We hope this bio of John and his preaching and presiding at worship today will be a valuable introduction. Pastor John Roberts was born June 9, 1949 in Detroit, Michigan. He was raised in the city and attended public schools through 9th grade. At the age of eight, he determined that he had been called to pastoral ministry. Raised in the Lutheran Church-Missouri Synod, he attended Lutheran High School East and Concordia Colleges in Ann Arbor, Michigan (A.A.) and Seward, Nebraska (B.S.inEd.) He is the eldest of four children. Life in the City of Detroit at the time was progressive and multicultural. Pastor John has always been active in the pursuit of music and the arts. His bachelor’s degree work centered in vocal music (early music) and drama. Pastor John began his seminary education at Concordia Seminary, St. Louis. But during his seminary training, the faculty was under constant condemnation by the LC-MS. He completed the first two years of seminary and was sent to internship (vicarage) in the Los Angeles area. The trial had lasted three years. When the faculty followed the student body into moratorium, the faculty was fired. The students and faculty left the campus and began Concordia Seminary-in-Exile, later known as Christ Seminary-Seminex. Pastor John remained in Los Angeles with the support of his internship congregation a second year to decide where to finish his final year of seminary. Finishing at the LC-MS’s seminary meant an assured first call. Finishing at Seminex meant a great deal of uncertainty. But Pastor John decided to follow his conscience and returned to graduate in May,1976 at Seminex. (Seminex merged 9 years later with the Lutheran School of Theology in Chicago.) This was not the first time, nor would it be the last, that John would have to make a difficult decision of conscience. John was ordained into the ministry of Word and Sacrament in the Association of Evangelical Lutheran Churches (AELC) on August 21st, 1976. His first call was to be a worker-priest working part-time at an LC-MS congregation in Anaheim, CA and teaching music at a Christian high school. But both positions only lasted 6 months. And so, he was employed by the Los Angeles Bar Association for two years as Director of Meetings while seeking another parish call. Pastor John married during his senior year in college and was married for 23 years. During his time in Los Angeles, his wife had two miscarriages and was hospitalized for schizophrenia. They moved to South Williamsport, PA for his first full-time call as Associate Pastor of the 1800 member Messiah Lutheran Church (LCA). Called to serve especially in Youth and Education ministry, Pastor John also served on Worship and Ecumenical committees of the Synod and served on the LCA steering committee for development of the Word and Witness training program, an educational resource to teach congregations an understanding of the Bible and how to witness their faith in daily life. The fourth year of ministry at Messiah also brought another hospitalization for his wife and the death of both John’s parents in Detroit. Pastor John left Pennsylvania for his home state soon after. He was called to be sole pastor of St. Philip’s Lutheran Church, Ypsilanti, Michigan in September, 1983. During the first years at St. Philip’s the congregation grew from average Sunday attendance of 35 to over 150 quickly. A very young, well-educated congregation, Pastor John used his talents in worship, education, and parish long-term development. He served as dean of the Ann Arbor cluster for 5 years. He served on the Synod’s Worship and Ecumenical Committees for many years and also served as a seminary intern supervisor for 6 interns from LSTC. During his second year at St. Philip’s, John and his wife adopted 4-month old twins from South Korea. John traveled to Korea to bring his sons, Aaron and Andrew home. Shortly after, his wife was again hospitalized. John was soon to face the most difficult decision in his life. Everything was going well at St. Philip’s and at home. The children were growing and entered a fine public school system. House and autos were paid for. The congregation had successfully welcomed a young member who transitioned from young woman to young man. A large group of adults had studied the first Statement on Sexuality of the ELCA. All this led John to take a position of honesty and integrity to announce to all that he was a gay man. The bishop asked for his resignation. Divorce and separation from his sons were soon to follow. John began a liturgical, ecumenical, gay ministry supported by an ELCA congregation in Southfield, Michigan. After five months of preparation, The Church of Saint Sergius and Saint Bacchus had 70 members at its first liturgy. But love brought John to Chicago. Unfortunately, after 7 years, the partnership ended. John attended St. Peter’s Episcopal Church and Holy Trinity Lutheran church before joining Resurrection Lutheran Church 10 years ago. During those 10 years, John sang in the choir, was an assisting minister, served on the Stewardship team, was the congregation’s Mission Interpreter and coordinated weekly emailed devotions written by members of Resurrection. In 2009, the ELCA Assembly made it possible for John to seek reinstatement to the ordained ministry. 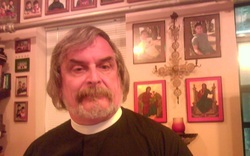 He was approved for reinstatement by the Metro Chicago Synod in January, 2011. Because of physical disability, Pastor John is only able to serve a part-time ministry but he has hopes of once again overcoming difficulty to serve the church as a pastor. John has remained very close to his two sons who are now physicians. Aaron is in residency in Medical Pediatrics in Kalamazoo, Michigan. Andrew will finish his residency living with his partner, Kevin in Washington, D.C.
Pastor John hopes to bring his life experience and his talents in worship, preaching, education, love of the arts, and involvement in the LGBTQ community to Unity as a part-time assistant pastor.